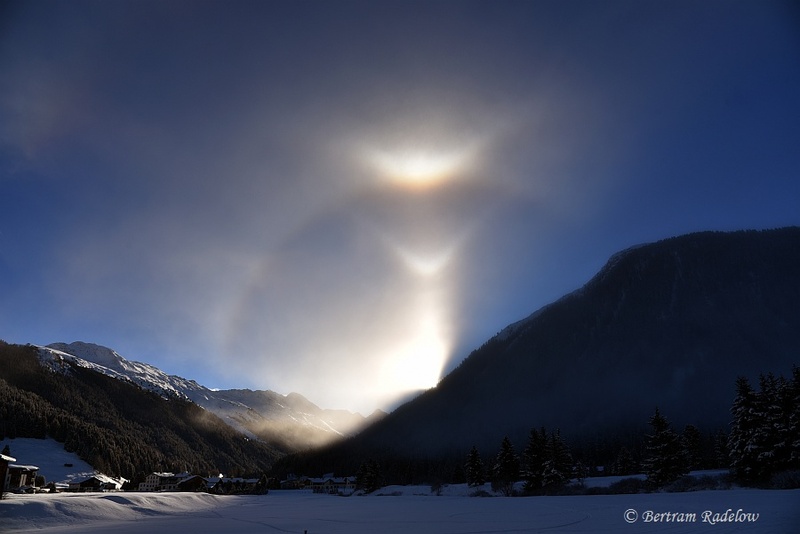 This report describes halo displays including Moilanen arcs (MAs) which occurred in Davos from 2005 to 2017, caused by snow gun induced diamond dust. Four of them are discussed in more detail. The MAs are presented in relation to the degree of ripening of the diamond dust crystals, and with respect to the other halo types in the displays. Davos is a world-renowned winter sport resort. Because of the decreasing amount of natural snow over the past decades, numerous snow guns have been installed. In the winter season 2017/18, more than 150 of them are running. Snow guns produce artificial snow made from clumps of small ice spheres without any discernible hexagonal crystal structures. However, a part of the water spray is converted into microscopically small ice spheres which drift off. These will serve as condensation seeds for larger crystals, often in column shape, but also plates do occur. Remarkably, MAs are preferably generated during the first stage of crystal growth. Full-ripe crystals produce only dull MAs or none at all. Due to the inflow of polar air in the night of december 1st to 2nd there was fog formation in the valleys of the ore mountains. 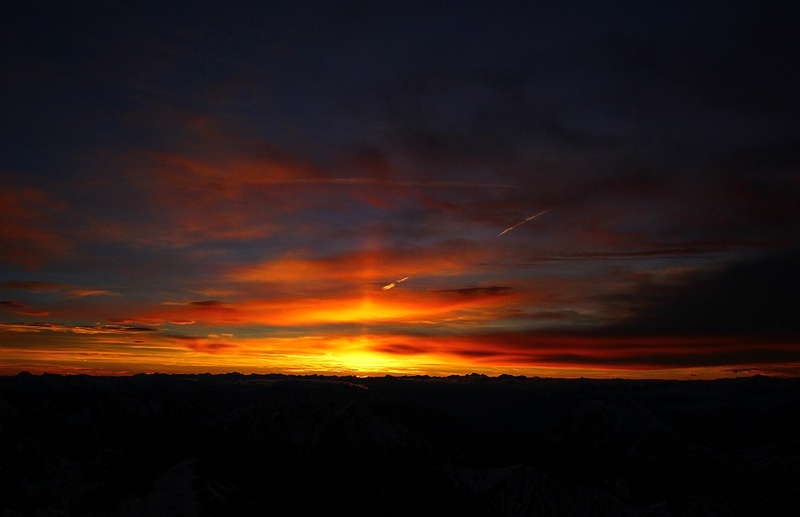 At the top of Fichtelberg (1214m above sea level) Claudia Hinz could observe the lower tangent arc and in parts also the submoon repeatedly in the lower sea of clouds. About 03.45 CET single shreds of clouds rose from the valley and forms an extensive halo phenomenon for 5 minutes as it is rare at the moon certainly. There was the 22°-halo, both parhelia, bright upper and lower tangent arcs, the complete light pillar, 46°-halo, supra- and infralateral arc, parhelic circle, submoon and both subparhelia. The evaluation of the photos revealed the Parry arc, the Lowitz arc on the left side and the upper and lower Tape arcs. During the day Wolfgang Hinz took over the further observation at the rim of the ore mountains. At the sun the halo types changed quite fast, too. 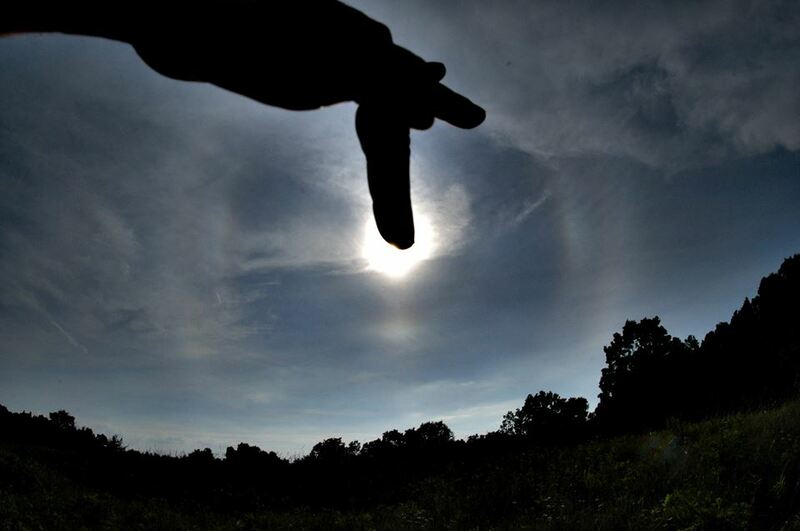 Several times the 16 visual observed halo types formed phenomena including 19 halos. Pictures showed two more halo types. Some halos lasted just for minutes, whereas the 22°-halo and the parhelia were there from 9.30 CET to 13.00 CET. But they appered earlier and continued towards the later afternoon. The Halos were observed on top of Fichtelberg and its surrounding area, at the border to Bohemia and at the Czech ski area Neklid, as well as on the way home in the mountain village Tellerhäuser. On March 26, 2017, I could observe this phenomenon for the second time. The first time I observed it in Munich about 20 years ago, when within a few minutes two boundles of “moving ripples” crossed a left-hand sundog. At that time I did not know what I was seeing. I learned it thereafter, also the name of the phenomenon, that it has been observed several times until then and that it may be related to acustic waves. Later, the video of the “extermination” of a sundog by a rocket launch became well known. But I did not see this phenomen again till March 26, 2017. It is just a “must” for me to photograph with my pocket camera every halo I see mostly only to get the time mark of its beginning and/or end for the record. On that day I was several times on my balcony to check for halos. The sky had only contrail-cirrus (now officially termed Ci-homomutatus), but no halos. But once I discovered a faint sundog it may have been the only halo-active contrail-cirrus group of that day. 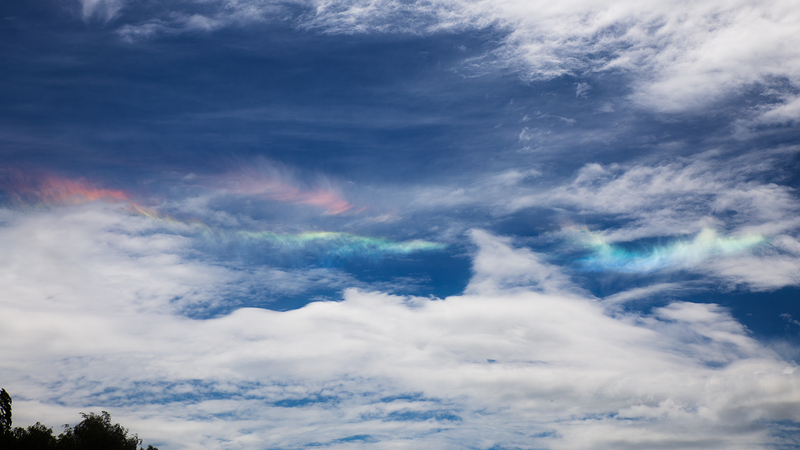 I observed the sundog coming and going with the respective cirrus couds resp. the standing sundog against the moving clouds. The sundog was faint the whole time and all but remarcable. But then I surprisingly realized that there were some odd dark strokes crossing part of the sundog diagonally. Remembering the moving ripples, I immediately zoomed in. I could record this phenomenon in some pictures. It did last only about 30 seconds, but visually the dark stripes were much more evident than the photographs suggest. The exceptionality of this observation was that the otherwise “moving” ripples were in fact “standing”: They moved with the cloud through the sundog. This can be seen very nicely on the photographs: the ripples seem to be a fixed structure of the cloud. But they were only visible in the area of the sundog. Outside this area the ripple pattern did not show up: the dark stripes were not there! Clearly recognizable is also the fact that each ripple began weak and increased its intensity towards a maximum in the centre of the ripple area, and to vanish at the other border of the ripple area. On November, 23rd, 2016, I observed in Altocumulus virga a sun pillar from Mt. Zugspitze which exhibited a certain amount of inclination with respect to the otherwise common vertical direction. At first it appeared rather diffuse, but later on the distinct tilt became clearly visible. That morning was relatively warm with temperatures around –3°C on the 2963 meter high summit, and a squally foehny wind gusted with peaks up to 80 km/h. Warm air was sucked from the Mediterranean sea by a severe southern air current. I suspect that this wind led to the inclination of the sun pillar by systematically tilting the ice crystal axes into a preferential direction. There are only a few similar observations that can be found in the literature. On January 1st, 1969, K. Lenggenhager documented a tilted and split lower sun pillar in diamond dust on the Mt. Säntis (2502m). He explained the phenomenon by air currents which were forced to ascend a ridge, and the crystal axes being turned by various amounts on different levels of altitude (see graphic from ). Similar conditions might have prevailed in my observation. The air masses of the Mediterranean sea were forced to ascend the Alps, and therefore they might have tipped the crystal axes increasingly with rising altitude. 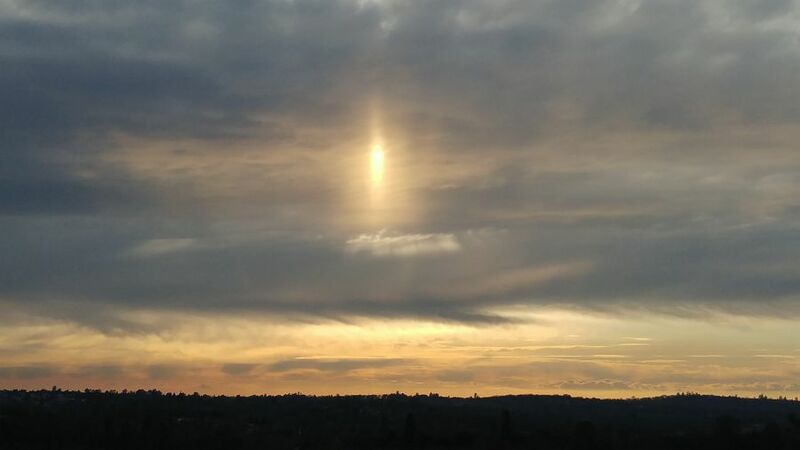 Another oblique sun pillar was described by Edgar W. Wooland after an observation in Boulder, Colorado  on January 10th, 1918, and I myself could also already observe oblique and displaced halos . Unfortunately, there seem to be no further documented cases. Any appropriate notes on the subject are highly welcome. On January 22nd 2017 I had the opportunity to witness a halo phenomenon in my home town for the first time. 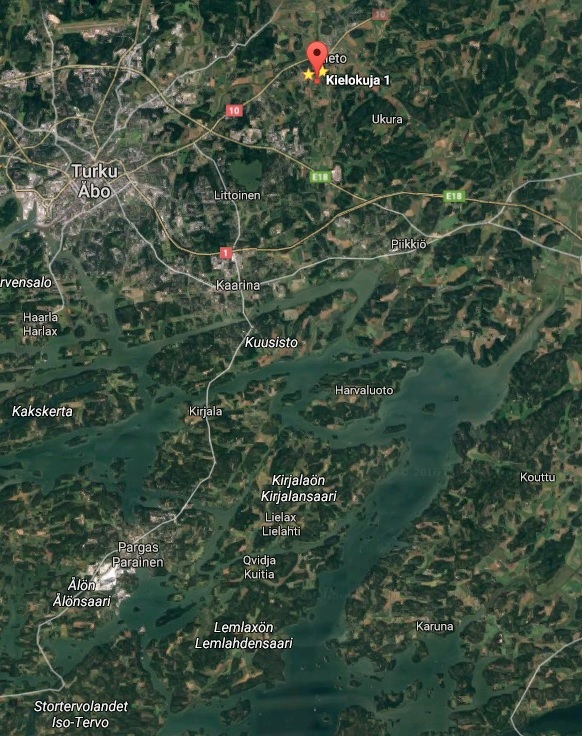 The observation took place in Jena-Maua Germany (50°51’59.4″N 11°36’02.0″E) from 8:45-10:45 CET within about one kilometer. The maximum activity was observed between 10:15 and 10:45 CET. We had a high-pressure weather situation with more and more lifting and dispelling fog (starting with 50m AGL) in the ‘Saale’-valley. Measured temperatures were about -10 to -6 degrees. After recognizing the lower sun pillar besides the left Subparhelia in front of the fog boundary (seen from 300m height) I drove closer to the fog and found myself standing inside diamond dust (height 150m). Between 9:45 and 10:45 the following types of halos have been witnessed: 22° halo, left and right parhelia, upper and lower tangent arcs, upper and lower sun pillar, Circumzenithal Arc, parhelic circle, Anthelion, left and right 120° parhelia, Supralateral arc, Parry arc, Subsun, left and right subparhelia, Tricker’s anthelic arc, Tapes arcs, Heliac arc and subhelic arc. Uncertainties exist concerning the following observations: Lowitz arcs and Moilanen arc. 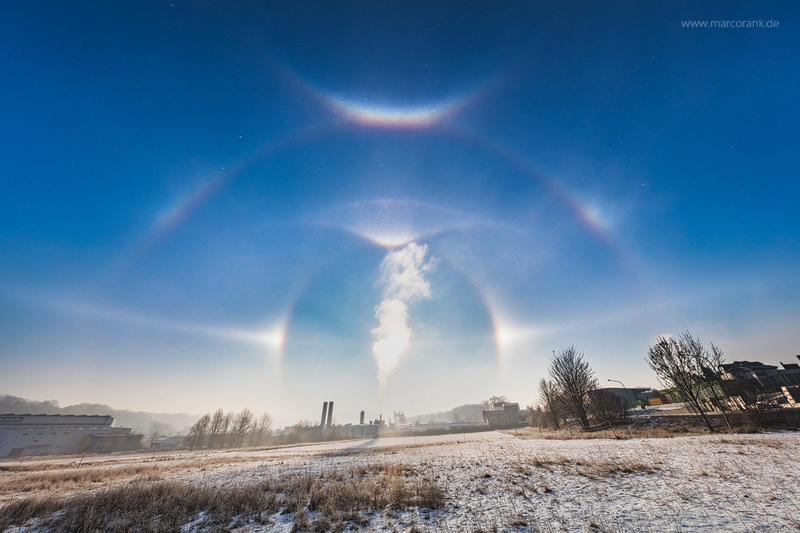 To sum up the best possibility of seeing this phenomenon was inside or near Jena-Maua – a small district of the city Jena which has some industry chimneys (compare the last photographs with the smoke trail). It seems legit to suppose that industrial fine particules conduced sublimation/condensation nucleus for the diamond dust development. 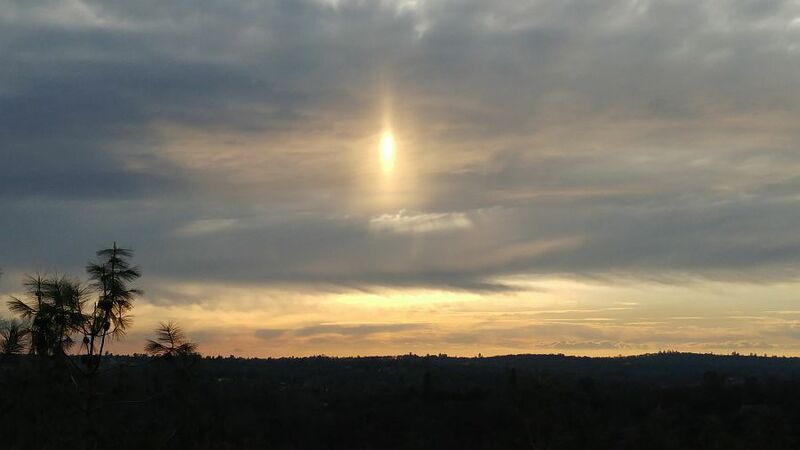 On January 25, 2017 I observed a reflection subsun in Auburn, California. This was my second observation of this phenomenon, the first of which was on February 1, 2008 and is already documented here. The conditions between the two observations are nearly identical: The observing location, time of day, and time of year. Also of note is that both were seen following a multi-day period of heavy rains, which supplied the water that reflected the sun upward toward the Altocumulus cloud. The water had filled the Yolo Bypass, which is an area that is designed to flood during periods of heavy precipitation and lies along the line of sight between Auburn and the setting sun. 6th January, 2017, I observed quite a clear reflection subsun in the southern Finland. It was morning, local time around 11am. I looked outside and saw a nice sun pillar. And clouds, that were about to block the Sun. So I went to take photos of the pillar before it was too late. I got the pictures and stayed for a while and saw the clouds running over the Sun. Surprisingly, the pillar didnt disappear. I waited for a little while longer but the halo was stubborn. Then I realized, the source was not the Sun, directly, but its reflection! The sea is a couple of miles away and wasnt yet frozen (map). On the other hand, it has been found that some of the aesthetically more pleasing CHA apparitions occur at 65° solar elevation or less. This is because the CHA gets wider then, therefore increasing the dispersion of spectral colors. Such CHAs are also situated less high in the sky, where they are more easily seen unintentionally. Also then, an interesting landscape in the foreground may add to the scene’s beauty. The following table contains a summary for the 2015 and 2016 CHA observations. Observations on the same day have been included, if from different places and reported in the said forum or – in just two cases – directly communicated to this author. Chance findings of related CHAs in other public networks and oral reports solicited by an AKM posts are carried separately. For consistency, three CHAs seen in far-away places by a travelling AKM member were not included in the count. The last column contains the count of AKM’s systematic visual observers. It is clear, that the CHA campaigns for 2015 and 2016 were comparably successful, definitely surpassing the counts for any earlier year. The competitive character of a call for CHAs stipulated an increased time log from skilled observers and made them aware of quite inconspicuous CHAs. Although the meteoros.de forum boasts many hundreds of members, the number of those contributing CHAs, was quite low. The CHA reports for 2015 and 2016, respectively, were delivered by 15 and 19 observers, respectively, who lump together to just 26 different persons for both years. So every CHA reporter on the average had 2.3 specimens. Besides different personal noon-day observing options, the more southerly observers were favored, of course. The most successful six of them recorded 34 CHAs (58% of the grand total). 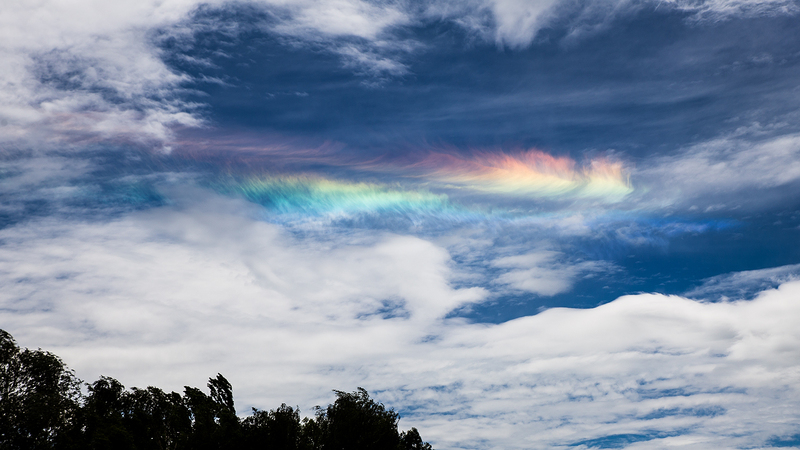 In concluding, some circumhorizon arc images from 2016 are duplicated from our forum. First place goes to a very nice spectrally pure example, seen June 15th at a solar elevation of 64.1o by Daniel Eggert near Neuburg (Danube). 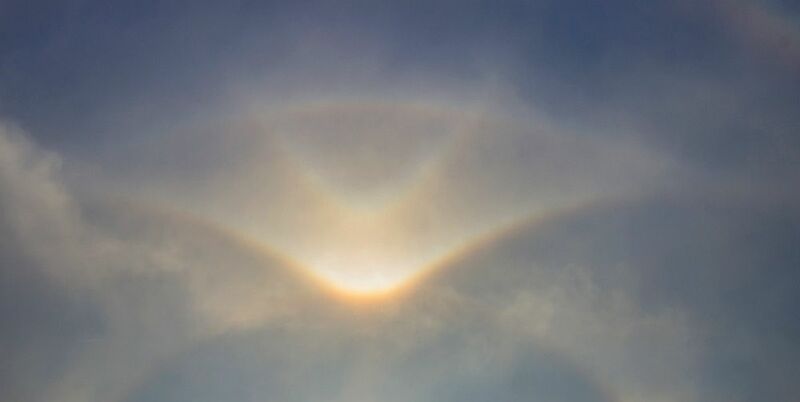 The photo by Isabelle Klein (a) shows a CHA underneath a 22o circumscribed halo, as photographed from the Autobahn A1 near Hermeskeil nine days earlier, on June 6th, at a solar elevation of 63.4o. Unsharp masking of this shot shows an infralateral arc curving upwards from the CHA. Not shown here is the also present complete parhelic circle. By contrast, Michael Großmann’s photo (b) from Aulendorf, taken June 18th at a solar elevation of 65.3o does not show any hints of a 22o halo. On July 6th, Elmar Schmidt experienced a long-lasting CHA display in Heidelberg (c). The sky was uniformly covered with cirrus clouds, which washed out the contrast for the halo, which extends for more than 60o of azimuth. To show this better, two portrait oriented wide-angle photos, taken at solar elevation of 63.4o, were stitched together, therefore artificially broadening the circumscribed 22o halo disproportionately w.r. to the CHA. Karl Kaiser in Schlägl, Austria, took his photo (d) of a delicately colored CHA on July 8th at a solar elevation angle of 63.4o.